The Leeds hotels listed below are either in the town or we have given a rough guide as to how far they are from Leeds. We hope you enjoy your stay and find your ideal accommodation. Station: LEEDS . 500metres. Directions from Leeds City Railway Station: Exit the station by the taxi rank side (near Marks & Spencers) Cross at the traffic lights and take the stairs opposite the station exit down to the street below. Turn right onto Bishopgate Street (the lower street). Follow the footpath under the bridge on Neville Street and continue ahead onto Victoria Road. Turn right at City Walk then left. (signposted Bewleys Hotel Pedestrian Access) The hotel is straight ahead. Station: LEEDS . 6miles. From the A1(M) North & South, exit at Junction 45 signposted for Leeds A64. Follow the single carriageway for approximately 4 miles. The hotel is on the left hand side at the 1st roundabout you reach. Take the 1st exit left & into the hotel slip road & car park. Station: LEEDS . 0.25miles. Junction 43 off M1 onto M621, then exit at Junction 3 signposted Leeds City Centre & Holbeck. Follow signs for City Centre, go pass the Hilton hotel on left & then under rail bridge. At the 2nd set of traffic lights turn left, get into middle lane & go straight through next lights onto Wellington Street. Turn right at small traffic island onto King Street, the hotel is on the right. The most famous landmark hotel in the city centre overlooking Leeds City Square. The Queens is a hotel proud of both its' 1930's Art Deco heritage and 4* modern luxury. The sumptuous surroundings extend to the Queens Grill, where you'll find relaxed dining by evening and a hearty English breakfast each morning. And if a lighter bite takes your fancy, the impressive Queens Bar awaits. Although we can't promise you won't be tempted by a traditional afternoon tea or one of our classic cocktails perhaps. Leisure facilities are available close by. And with the fantastic city of Leeds on your doorstep you couldn't be better positioned to explore the city's array of designer shops, restaurants and culture. QHotels named AA Hotel Group of the Year for 2008/09. Station: . 200metres. From the South M621, (M1 & M62) motorways, follow the signs to Leeds City Centre, along Neville Street, towards City Square. After the traffic lights, take a left into the slip road, in front of the Queens Hotel. Station: LEEDS . 0.25miles. From the South - M1 North merges onto M621 off Junction 3 onto A653, follow signs for Leeds City Centre. Station: GARFORTH. 1mile. From M1 Junction 46, take A63 eastbound and turn right at next roundabout. The hotel is situated nearby on the left. From the A1 take M1 south and come off at jct 46. From A1 travelling north, take the A63 sign posted to Leeds and travel for 4 miles until the A642 roundabout. Station: LEEDS . 750metres. FROM M62 AND M1- Leave the M1 at J43 and lead onto M621 Leeds Centre. Station: LEEDS . 3miles. The M1 northbound becomes the M621 once it has crossed the M62 at Junction 29. Station: LEEDS . 0.25miles. From M1 North/South Junction 43: turn off following signs for M621. Once on the M621 Junction 3 to city centre. You will pass Victoria Bridge & on your right the KPMG offices. Turn right in to Sovereign Street & continue until the last turning on the right hand side Concordia Street. Take this turning & you will find the hotel at the end on the right. Station: LEEDS . 6miles. From the North via the A1 - take the A58 from the A1 at Wetherby, heading towards Leeds, to the Leeds outer ring road (A6120). Turn right onto the A6120 for 5 miles to the third roundabout (Lawnswood). Turn right at this roundabout onto the A660, signposted for Airport & Skipton. The hotel is 2 miles from the roundabout, on the right hand side. The New Ellington Hotel is a 5-minute walk from Leeds Train Station and Leeds Shopping Plaza. The Ellington offers large rooms with rain showers, Nespresso coffee machines and free Wi-Fi. Located within easy reach of the M62 and M1, this Premier Inn is 1.5 miles (2.4 km) from Leeds city centre and convenient for Leeds Train Station, shops and local amenities. This modern 3-star hotel is in Leeds city centre, 600 metres from the University of Leeds. It has a brasserie-style restaurant, lounge bar, discounted parking and en suite rooms with flat screen TVs. Just a mile (1.6 km) from junction 46 of the M1 motorway and less than half a mile (800 m) from Cross Gates Railway Station, the hotel offers comfortable, great-value rooms and free parking. The Premier Inn Leeds East is only 4.5 miles (7. 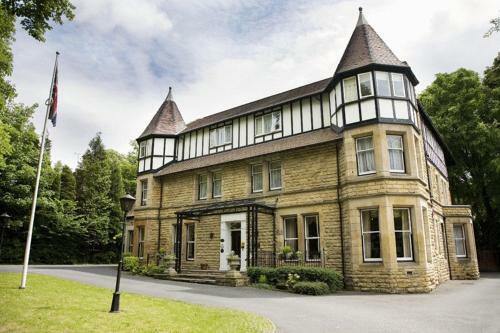 Haley's Hotel is a grand building situated in a quiet area, 2 miles from Leeds city centre. It has an award-winning restaurant, free Wi-Fi and free parking. Just half a mile from Leeds centre, Ibis Leeds features a restaurant and modern rooms with satellite TV. The popular shopping streets and Victoria Quarter are a 10-minute walk away. In the centre of Leeds at Waterloo Court, the Kspace Apartments offer luxury accommodation. Apartments feature balconies, en suite bathrooms, kitchens, dining areas and free Wi-Fi. Parking is available. 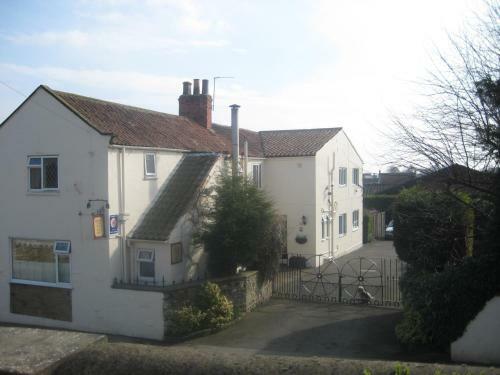 On the outskirts of Leeds, Tall Trees Hotel offers free parking, en suite rooms and free Wi-Fi. Leeds and Wakefield city centres' are just 10 minutes' drive away. All of the bedrooms at The Tall Trees have TVs and tea/coffee. These serviced apartments with free internet are in Leeds city centre, a 10-minute walk from Leeds Train Station and about 500 metres from Leeds Corn Exchange. Just 15 minutes' walk from Leeds Railway Station, the Etap Hotel provides easy access to the city centre. It offers budget accommodation with modern decor and facilities. In Leeds' business district, close to shops and nightlife, this hotel is less than 10 minutes' walk from Leeds City Station. It offers stylish rooms with satellite TV, and an open-plan restaurant. With stylish, spacious rooms and free Wi-Fi, Bewleys Hotel Leeds is just 15 minutes' walk from Leeds Rail Station. Guests can make use of the gym, while Leeds city centre is a 10-minute walk away. In 77 acres of stunning parkland, minutes from the cities of Leeds and York, this historical former monastery is now a 4-star luxury hotel with a spa and individually decorated bedrooms. Opened in 2008, this brand-new modern hotel features cutting-edge style, sleek contemporary accommodation and superb state-of-the-art facilities. By Golden Acre Park, the Ramada Leeds Parkway has an indoor pool, gym and free parking. Leeds Bradford Airport is 5 miles away. Each bedroom has a Hypnos bed and a flat-screen TV with satellite channels, pay movies and music. Just 5 minutes' drive from Leeds Bradford Airport, Britannia Hotel has a leisure centre, spacious bedrooms and a restaurant. There is free parking, free Wi-Fi, and Leeds centre is 20 minutes away. In a superb location, Mint Hotel Leeds is part of the Granary Wharf area, next to Leeds Train Station and the canal. The Victoria Quarter is a shopping district nearby. Set in a 200-year old building, Wheelgate Guest House offers cooked breakfasts and leafy gardens. The house is situated in Sherburn in Elmet, just a 30-minute drive from York and Leeds. In Leeds city centre, next to Leeds Railway Station, the Discovery Inn offers cosy rooms and a 24-hour front desk. 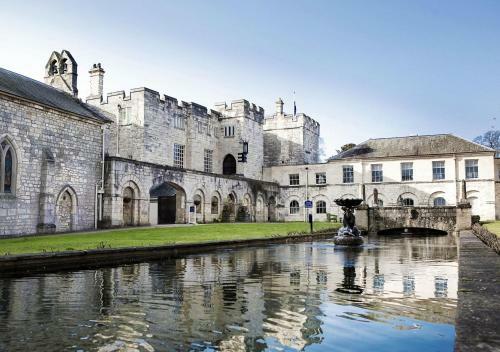 The Royal Armouries Museum is a 15-minute walk away. Set in 9 acres of wooded grounds, the 4-star Weetwood Hall Hotel is a 17th-century manor house with an award-winning pub. The hotel is just outside Leeds centre, a 10-minute drive from Leeds Airport. Close to the heart of the city centre, just 0.7 miles (1.1 km) from Leeds Railway Station, the hotel offers great value, with free parking and comfortable, modern, air-conditioned rooms. With private parking, a stylish restaurant and fitness centre, Novotel Leeds offers spacious rooms with iPod docks. The hotel is situated in central Leeds, just 500 metres from Leeds Railway Station. This stylish aparthotel is less than a mile (1.6 km) from Leeds Rail Station and the city centre. 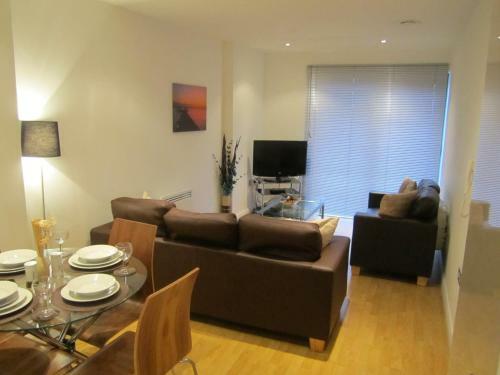 The large, modern apartments have flat-screen TVs, kitchens and free broadband internet access. This 18th-century mansion has award-winning cuisine, a fabulous spa and a 27-hole golf complex in its fabulous grounds. The historic Oulton Hall is Yorkshire's only 5-star luxury hotel.